This month, I was working with a very intelligent, very educated, and very perceptive English learner who identified her main problem with English as an emotional issue. She explained to me that, although she had learned English in school as a young girl (over 20 years ago), she never really learned to use it. A year ago, she started practicing her English again. She started writing emails to colleagues, she started listening to the BBC radio, and she started trying to speak. When she started, she said she felt great about her success, but now, a year later, she feels terrible about her English. It gives her anxiety and she “feels bad” when she speaks it. I believe that this anxiety is common to language learners, and that it could be related to the language learner's progression through the Conscious Competence model. 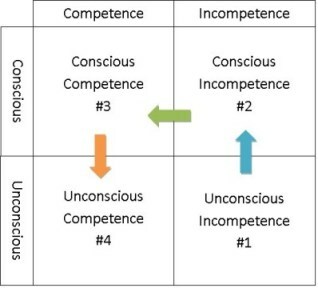 In the first step, the language learners are not conscious of the lack of competence in the language. As they move through the model, they become aware of their incompetency. Although this eventually leads to language learning (because they realize that there are deficiencies in their language), I believe that it also increases anxiety (because, again, they realize that there are deficiencies in their language). This negative language reflects a low language self-esteem, which can be very damaging tto possible success, as well as to future reduction of anxiety. Negative statements about language learning keep the learner in a constant mindset of pending failure. I feel that learners' emotions are often overlooked in language learning. Stress, anxiety, or general bad feelings about language learning prevents learners from accessing the language that they already have, and additionally, from acquiring the language that are exposed to. Here is an interesting article that discusses this topic and a different article on the same information where you can read the abstract or buy the research that these two news articles talk about. Krashen's Affective Filter hypothesis proposes that affective factors create a mental block that prevents language input from reaching the language acquisition part of the brain. Lower Your Anxiety: The best way to lower anxiety is to relax. Listen to music, laugh, play a game, or meditate! A while ago, Ann Evans from Linguistics in the Classroom wrote about how she uses meditation in the language classroom. This is a great example of lowering anxiety. Encourage Yourself: Help students overcome negative language self-esteem by making them act positively. Have them write down positive strides that they've made in language learning, or help them set achievable short-term goals that they can reward themselves for. Take Your Emotional Temperature: Increasing learners' awareness of emotions is very important, as well. Often, they don't know what they are feeling, or even that stress and anxiety are normal. Help them identify how their anxiety and stress may be playing out in their lives, and then show them how to counteract it (with the other two affective strategies)! A good tool for taking your emotional temperature is using some sort of checklist (with the different emotions) and having students identify what they are feeling daily. Hi!... I want to know where did you get that information from Oxford 1990? is this one? "Language Learning Strategies. What every teacher should know"? If so, do you have an online version in PDF format or something like that? I would appreciate it so much.